In this post: 2017 Back 2 School pics. 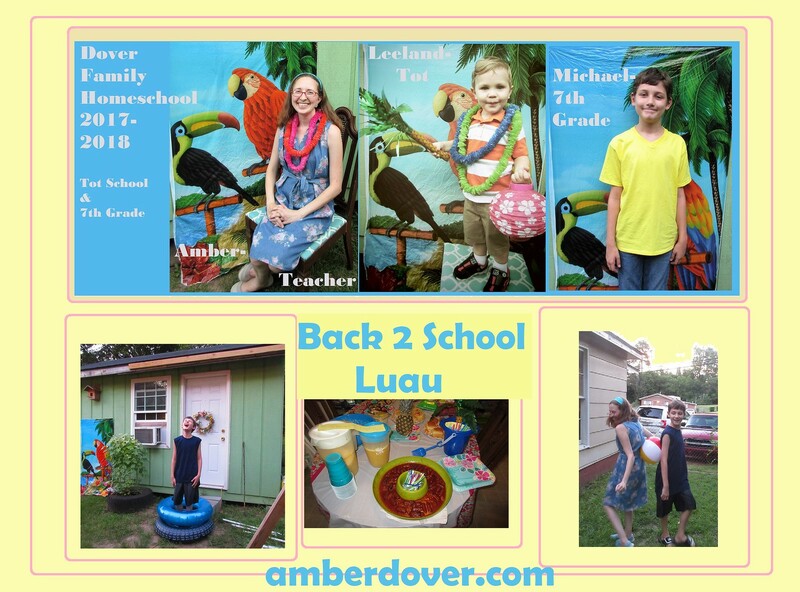 Our Back 2 School Luau with fun games and yummy food! Also, Back 2 School Eve and 7th-grade curriculum. Hello, Dear Ones! This is the second of my latest Back 2 School posts. Michael is now in 8th grade so this is actually from last year. Leeland had Tot school & really kept busy. He was two years old then! We did a delicious Pizza Party for 6th grade, but for 7th grade, we had a nice Luau. Here’s how we did it! The Set– Leis, pineapple lanterns, palm trees, and grass skirts. I got all of these from Dollar Tree. Some of them I had left over from another party. Mickey dressed up and showed off the Tot school area. It used to be my office. Food- I got my tableware and the bucket at Dollar Tree. We had a feast! Our cardboard cathedral in the schoolhouse. It waits for 7th grade and our study of the Middle Ages to start. This year I just put out our books for everyone to sample. Pool Ring Toss- We had a blast with this game. Here’s Leeland chilling on the sprinkler pad. Beach Ball Dash– You and your partner must keep the beach ball between your backs as you race to the finish. Tessa & Mickey dressing the part! Back 2 School Eve- a night of cereal! This was an unusual but fitting supper. Cereal Mixing– I think Michael had Cocoa Puff Lucky Charms. Leeland finishing his milk with a straw! Bible– Since we skipped Bob Jones the year before, I decided to go back a grade for our 7th Grade Bible. BJU Bible. Reading- Several history-themed books. Also, Narnia, The Screwtape Letters, & C.S. Lewis’ Bio. You can find them here. History- Mystery of History 2 & Monks & Mystics. Art- Pinterest ideas either for history or holidays/seasons.